Servicing restaurants, wineries, and breweries. 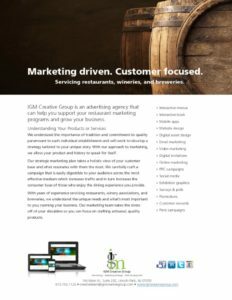 IGM Creative Group is an advertising agency that can help you support your restaurant marketing programs and grow your business. We understand the importance of tradition and commitment to quality paramount to each individual establishment and will work to develop a strategy tailored to your unique story. With our approach to marketing, we allow your product and history to speak for itself. Our strategic marketing plan takes a holistic view of your customer base and what resonates with them the most. We carefully craft a campaign that is easily digestible to your audience across the most effective medium which increases traffic and in turn increases the consumer base of those who enjoy the dining experience you provide. With years of experience servicing restaurants, winery associations, and breweries, we understand the unique needs and what’s most important to you; running your business. Our marketing team takes the stress off of your shoulders so you can focus on crafting artisanal, quality products.  Let us handle your next marketing project!